The Bad Plus, a Minneapolis-based jazz trio, came to San Francisco last week with a fascinating creation that they have been polishing for a year at New York’s Lincoln Center. Their approach to Igor Stravinsky’s Rite of Spring was a potent jazz treatment of a revolutionary work. In 1913 Stravinsky’s piece, written for Diaghilev’s Ballet Russe and choreographer Vaslav Nijinsky, started a riot that required the police to close Paris’ Théâtre des Champs-Élysées. The unexpectedly savage music, coupled to a story that seemed part mating ritual and part human sacrifice, and with Nijinsky’s “ugly” choreography of awkward jumps and belly flops, caused fist fights even before the intermission! If the Bad Plus were hoping for the same, the cheers and standing ovations would have disappointed them. There were a few, including the lovely lady next to me, who stayed in their seats. “I hated the spotlights shining in my eyes, and the blurred video made me dizzy.” Others, perhaps thinking they were going to hear Stravinsky redone as music to dine by, were unprepared for the amplified assault of sound, as the Bad tried to duplicate the shock value of the original. Granted, though not for everyone, it recreates Stravinsky’s force and originality as rock opera. This trio has garnered a reputation in progressive music over the last decade—and probably started a movement—by interpreting deep musical thought in an accessible genre, what they like to call “avant-garde populism.” It is an approach that allows them to mine classical, contemporary, pop, rock and indie, while finding their own identity. Their unusual trio consists of pianist Ethan Iverson, stand-up bass player Reid Anderson and drummer David King. I was able to hear Iverson in April of 2010 at Herbst, courtesy of SF Performances, when he demonstrated a range of twentieth century musical passages to accompany a lecture by music critic Alex Ross. His control of multiple styles was eye opening. Playing from behind the curtains, Iverson began Stravinsky’s well-known “pagan” theme with hesitant notes, matching the cool delivery of the original oboe and clarinet. Lights slowly danced into focus, the bare branches of a Russian spring. The piano was heavily amped and unpedaled, spare and percussive, with each note dying quickly. Shimmers of percussion added an unlikely fluidity to balance the severe piano notes, and then Anderson softened their mix with a smoky bass. When the curtain rose, Nijinsky’s wild village dance was treated with heavy cross-rhythms and elements of abandon, all hugely amplified. Difficult piano chords were turned into muscular tone clusters, and the percussion stuttered and strutted across the sharply cutting rhythms. They chose to begin the job of re-imagining the work with the most difficult part—the finale. It was an awesome culmination, grim, ecstatic, disquieting, and not just a tribute to Stravinsky, but their own sturdy artistic statement. The video work, sadly, was not equal to the music, and I would be a little surprised if the whole had the subtlety to translate to dance, as did the original. After intermission they played a set from their newly released CD, showing much of the development that led them to this venture: the slow, spectral fades, the slashing vitality, the complex “sentence” structure. Their regular work is delightfully offbeat. But their Rite of Spring is truly iconic. The fact that San Francisco Performances hosted this may reflect founder and director Ruth Felt’s canny ear for the unusual and her twin loves of jazz and classical. A twofer! 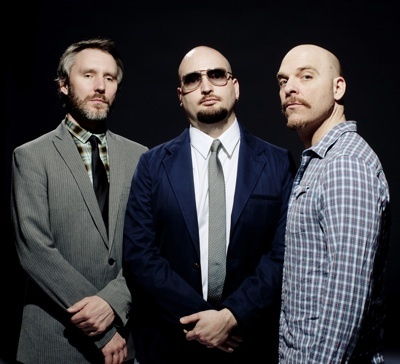 Photo of the Bad Plus from left, Reid Anderson, Ethan Iverson and David King; photo by Cameron Wittig.